The hit CGI animated adventure is in the works for Blu-ray and Blu-ray 3D! In an early announcement to retailers, Paramount Is preparing 'The Adventures of Tintin' and 'The Adventures of Tintin - 3D' for a home video release in the near future. 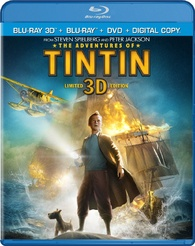 From Academy Award®-winning filmmakers Steven Spielberg and Peter Jackson comes the epic adventures of Tintin. Racing to uncover the secrets of a sunken ship that may hold a vast fortune -- but also an ancient curse -- Tintin and his loyal dog Snowy embark on an action-packed journey around the world that critics are calling “fun for the whole family.”* *ABC-TV (Chicago). Specs and supplements have yet to be revealed, but suggested list price for the Blu-ray is $44.99 and the Blu-ray 3D is $54.99. You can find the latest specs for 'The Adventures of Tintin' linked from our Blu-ray Release Schedule, where it's indexed under PENDING.